Following a stabbing and shooting attack in occupied East Jerusalem on Friday, 16 June 2017, that resulted in the killing of three Palestinian youngsters and an Israeli female soldier, the Israeli forces imposed additional collective punishment measures against the Palestinian civilians in occupied Jerusalem and later in Deir Abu Mash’al village, northwest of Ramallah, from which the three youngsters come. he Palestinian Center for Human Rights (PCHR) strongly condemns these measures and stresses they fall within the collective punishment policy which is prohibited in the international human rights law. PCHR further calls upon the international community to work on protecting the Palestinian civilians in the occupied Palestinian territory (oPt) and ensure its application. According to PCHR’s investigations, after the abovementioned attack, the Israeli forces completely closed Bab al-Amoud (Damascus Gate) area, Sultan Suleiman Street and all gates of Jerusalem, excluding Bab al-Asbat (Lions Gate). They banned the Palestinians from entering and exiting the Old City and obliged the commercial stores’ owners to shut down otherwise they would pay a fine of over NIS 40,000. The Israeli officers chased the civilians who were at Bab al-Sahera (Herod’s Gate), al-Mesrara and Nablus Street and fired sound bombs at them. Moreover, they assaulted some civilians and pushed the journalists away from the scene. The Israeli forces mobilized all over Jerusalem, mainly the streets of Nablus, Bab al-Sahera, Sultan Suleiman and al-Mesrara. Israeli forces stopped the by-passers and checked their IDs and then deported the West Bank residents by buses distributed throughout the city. The Israeli police declared they “Deported over 350 Palestinians, who entered Jerusalem without permits, and returned them to the Palestinian territories”. 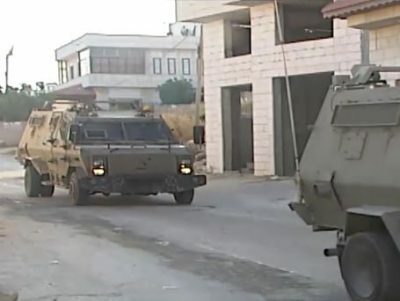 In the same context, after the identities of the three Palestinian youngsters, who carried out the stabbing and shooting attack, were disclosed, Israeli forces moved into Deir Abu Mash’al village, northwest of Ramallah, from which the youngster come. They closed the main entrance by establishing an iron gate and closed the roads with sand and rocks, isolating the village from the world. According to PCHR’s investigations, at approximately 05:30 on Saturday, 17 June 2017, Israeli forces moved into the said village and imposed a curfew. Bara’ Ibrahim Saleh Ata (18). The area of his family house is 140 square meters and his family members are 6. Furthermore, Israeli forces raided, searched and damaged the contents of dozens of houses belonging to relatives of the attackers and confiscated permits they had to Israel. In the meanwhile, a number of youngsters gathered in the center of the village and threw stones and empty bottles at the Israeli soldiers, who immediately opened fire in response. As a result, two Palestinian civilians were wounded. The first sustained a live bullet wound to the right leg and the other sustained a rubber-coated metal bullet wound to the right hand. They were both taken to Palestine Medical Complex in Ramallah to receive the necessary medical treatment. Demands States Parties to the Geneva Conventions to fulfill their obligations under these Conventions by exercising their Universal Jurisdiction to hold the war criminals accountable regardless of the criminals’ nationalities and the place where the crimes were committed and put an end to the impunity they enjoy for decades.